Just when I think Spring has arrived, a wave of non-springlike weather arrives, followed on its heels by a wave of summer/spring weather. Do I mow, do I not mow, do I mulch, do I not mulch, do I plant those newborn vegetables, etc.? Such decisions…. Really, it is not so bad and I go with the flow. My intention lately has been to go with whatever presents itself. I still plan and create the conditions for movement on a pathway but if a big boulder gets set down on my pathway, I strive to stop, consider how to carve a new pathway around the boulder or even climb up the boulder to reach new heights. When we begin our class, we may set an intention for our practice, when we wake, we may set an intention for our day. These intentions may be broad sweeping or specific to one goal. The following article gives wonderful suggestions for setting a broader, more positive intention or Sankalpa. Take out your journals after reading it, and maybe go through some of the exercises listed below. If all else fails, doodle in your journal! 10 beautiful breaths brings you to the present, the here and now. A great way to transition in a yoga class, or anytime in your life where a little space is needed before moving onto the next thing. 10 long inhalations, 10 long exhalations. 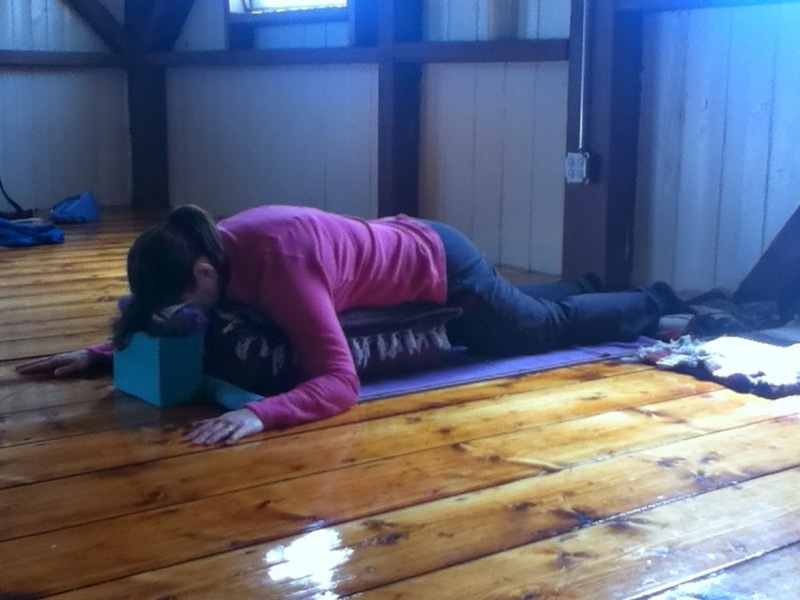 Feel your body expand with the breath in and feel it release and become centered. Again we changed this a little to make it lower, more grounded. Place two blankets stacked on top of each other lengthwise. Recline head, upper body onto blankets. Bring feet together in bandakonasana with support under the knees. Arms can rest by your side with an eye pillow over the eyes and any other support under your neck. As we have entered the windy fall, allow a blanket to hug in your body warmth. Stay for 10 minutes, breathing into sensation.